It’s one of several CPAP alternatives for those with sleep apnea. Your partner will let you know if you might benefit from an appliance that helps beat snoring. If you snore, and you’ve tried sleeping on your side and various other “tricks” to quiet your nighttime breathing, you may want to consider a snoring mouthguard, also called a snoring mouthpiece. It’s a dental appliance that keeps the jaw pushed slightly forward while you sleep to help ensure that your airway stays open and breathing is easier. For many people, snoring is a symptom of sleep apnea, a condition in which the muscles and tissue in the back of the throat become so relaxed while sleeping that the airway in the throat becomes blocked. Sleep apnea is a potentially serious condition that can raise your blood pressure and increase your odds of stroke, heart attack, depression, and other devastating conditions. The gold standard treatment for sleep apnea is continuous positive airway pressure (CPAP), which employs a small bedside machine that sends air through a tube and a mask that fits snugly over your nose and mouth. Because this therapy is uncomfortable for some people, doctors are always developing new CPAP alternatives. 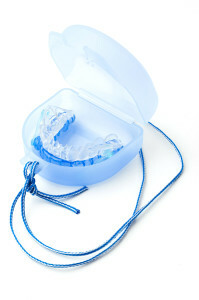 A snoring mouthguard is one commonly used example. Snoring is more than just loud breathing while asleep. It occurs when your tongue muscle recedes and your throat tissue becomes relaxed. Even if the airway isn’t blocked, as it is with sleep apnea, the relaxed muscle and tissue can vibrate as you inhale (and exhale, but to a lesser degree). More than 90 million people in the U.S. snore sometimes, with about a third of those snoring on a regular basis, according to the National Sleep Foundation. Men tend to snore more than women, and older adults tend to snore more than younger adults and children. Being overweight, especially if your neck circumference is large, raises your risk of sleep apnea and snoring. But the truth is that anyone is a potential snorer, regardless of age, gender, weight or health. But a snoring mouthguard might not be right for everyone. You may not be aware that you snore, but if you do, your bed partner may be able to describe in great detail the way you “saw logs” in your sleep. If snoring is something you do regularly, you should discuss the issue with your doctor. Even if your partner hasn’t noticed pauses in your breathing—which would indicate sleep apnea—the snoring may still be a sign that you should be evaluated for the condition. A sleep specialist can oversee an overnight sleep test, in which your breathing patterns are recorded in detail. If sleep apnea is the diagnosis, you may be advised to try CPAP. It’s an extremely effective treatment. However, many people who try it find the noise of the machine bothersome. Or they can never get used to wearing the mask. In these cases, CPAP alternatives should be explored. Studies have shown that a snoring mouthguard may be as effective as CPAP in helping to control blood pressure increases caused by sleep apnea. And if you get used to wearing it, a snoring mouthguard will be less cumbersome and much quieter than CPAP therapy. A snoring mouthguard should be made specially for you. You may see some products on store shelves, but an ill-fitting device could cause you more problems. Your dentist should be able to make an impression of your mouth and then send it to an affiliated sleep-dental professional, who will manufacture a device specifically to fit your jaw and teeth structure. A mouthguard for snoring moves the jaw to help separate tissue that vibrates when air is taken in or expelled. Some adjustment of the device may be needed once you get it home and try it out. Your dentist may be able to do that work in his office. You’ll learn how to use it and how to keep it clean. There will be a period of time needed for you to get used to wearing the device at night. But if it’s effective, and you sleep better and have more energy during the day, you may find this new addition to your sleep routine a welcome one. A follow-up sleep study may be recommended a few months after you start wearing the snoring mouthguard to see if it’s making a difference with your sleep apnea. Many snoring mouthguard devices have been approved by the U.S. Food and Drug Administration, so feel confident that this is a legitimate treatment among a growing field of CPAP alternatives. CPAP alternatives include more than a snoring mouthguard or snoring mouthpiece. You may be a candidate for surgery. Someone with very large tonsils may be cured of sleep apnea if the tonsils were the cause of the breathing problem. Other surgical interventions can reduce the amount of tissue in the throat just enough to keep the airway open. And sometimes, simply losing weight and reducing your neck circumference can make a difference. Because snoring and sleep apnea can signal serious health problems, don’t hesitate to seek help. Snoring isn’t just an annoyance to your partner. It’s a condition that, thanks to the snoring mouthguard and other CPAP alternatives, is becoming more easily treated every year. apnea, blood pressure, children, control blood pressure, cpap, cpap alternatives, depression, food, health, health problems, heart attack, how to cure sleep apnea, how to stop snoring, losing weight, more energy, muscle, people snoring, sleep, sleep apnea, sleep routine, sleep study, sleep test, snoring, snoring aids, snoring aids that work, snoring and sleep apnea, snoring mouthpiece, stop snoring, stroke, why do people snore. I thought you might be interested in this article on https://universityhealthnews.com: Would You Benefit From a Snoring Mouthguard?